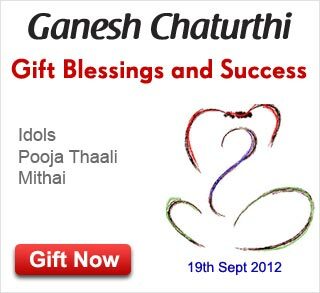 Ganesh Chaturthi is on 19th September 2012. Here are some little known facts about this huge Hindu festival. The devotees of Ganesha are known as ‘Ganapatyas’, and the festival to celebrate and glorify him is called Ganesh Chaturthi. He is known as the Lord of success and destroyer of evil. He is also worshipped as the god of education, knowledge, wisdom and wealth. Gifting ganesh idol is considered as good luck on this occasion. Also pooja thali is a very useful gift as everyone performs Ganesh puja during this festival and it can also be used for daily aarti. Modak is among the main sweets that is given as prasad during ganesh chaturthi because it was Lord Ganesha’s favourite. Other than that people also give ladoos and pedas. We also have decorative ganesh wall hangings and clocks for the home in our collection. Wish your near and dear ones across India with our very special collection. You can choose from a variety of mithais, poojathaalis, beautiful ganesh idols, designer ganesh diamond pendants, home decor items and lots more to celebrate this auspicious occasion. May Lord Ganesha shower you with his choicest blessings and grant you success in all your endeavours. We at Tajonline wish you a very Happy Ganesh Chaturthi!